Dear all, it is with great pleasure that I can announce You the launch of our pre-beta: the decentralized hedge fund platform RigoBlock. RigoBlock is a completely blockchain-based platform, built applying the most Rigorous practices for developing smart contracts on the Ethereum Blockchain: “Condition-Oriented-Programming”. We pride ourselves of using a completely server-less infrastructure, and we have developed an environment where we can guarantee infinite scalability and a wonderful user-experience. We have room for anyone willing to test our products: Gabcoin, Drago and Exchange. Gabcoins allow users to pool Ether from the crowd acting as a trustless custodial service. Each user can create their own Gabcoin and we, at RigoBlock, never have access to any of the funds. Further to that, Gabcoins are pre-set to interact with Casper, the bleeding-edge soon-to-be-published ethereum Proof-of-Stake mining algorithm. Dragos allow users to pool Ether from the crowd and trade on decentralized exchanges, with the greatest degree of transparency and accountability ever seen. Again, this happens in a completely trustless way as neither RigoBlock nor a drago’s creator can ever access the funds. Exchange allows users to trade crypto-derivatives contracts. Dragos should not be new to you, as we showed our first Proof-of-Concept in late Summer 2016 already! We have been fully focused to bring our vision to reality, and today we are ready to show you our bleeding-edge product. 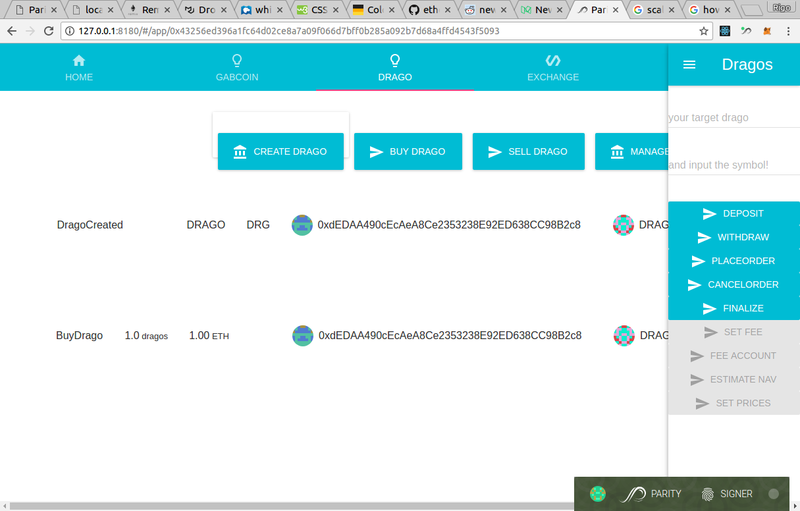 This picture is a screenshot of the Drago application from our UI. As you can see, you can browse our dapp alongside you other web pages in your web browser. Isn’t it awesome? Exchange is the first standalone decentralized exchange allowed to interact with dragos. Dragos, however, are structured so that trading may be extended to other decentralized exchanges as well. In order to achieve such a remarkable goal, we have developed a modular and rather complex structure of smart-contracts on the Ethereum blockchain. AND TO MAKE IT SIMPLE FOR USERS, we have developed an easy-to-use platform. Just by the use of name and symbol users can interact with their preferred gabcoin or drago. Isn’t it AWESOME? There are no fees to drago holders, as we aim at disrupting the traditional concepts of management fee and performance fee. Rather, we propose an alternative reward based on a fully visible subscription/redemption fee at the discretion of the drago creator, so that reward is tightly linked to long-term performance. In order to enhance meritocracy, we propose a Proof-of-Performance mining algorithm, where traders are allowed to mint RigoBlock tokens based on their risk-adjusted performance. In order to distribute our tokens we will announce a Contribution period which will occur late this summer. The RigoBlock platform is accessible in the Parity Dapp Store on the Kovan network. We would love everyone to join our pre-beta, however, since we do not use standard https for our platform, we pre-advise you it might be a bit tricky (for now) for those of you who are not familiar with the Parity Store (which is the Apple store for decentralized applications).